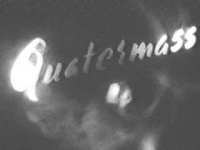 It was at Riverside Studios at the end of 1955 that we dubbed the film inserts for each episode of "Quatermass Two". The title music came from the Nixa LP of Mars, from Holst's "Planets". 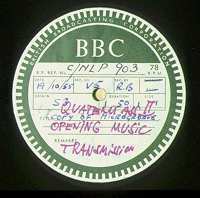 Since the dubbing theatres weren't yet equipped to play LP discs the music had been copied onto a BBC 78rpm acetate disk. The Gram desks, known as TD7s, had EMI type 12 pickups on a parallel tracking arm, and these weren't kind to records, especially soft acetate disks like this one, and the disks would quickly wear (the official maxim from the BBC's Recording Department was "they're fine, on first replay".....). So I had a bright idea and suggested that while the disk was still in good condition the music be rerecorded from the disk onto 35mm magnetic track and laid to the opening title for each episode, and this was done. The Producer of the Quatermass serials was Rudolph Cartier, (seen here with Sonia Dresdel), and during the dubbing (without Sonia Dresdel) he'd sit alongside the mixer and yell "Grams" at me whenever he thought something should occur. However, when we rehearsed we used a footage counter on screen and I would note down the precise points at which to cue in the various discs, - so I completely ignored him. He did say afterwards with his soft Austrian accent, "You were right, you were right". 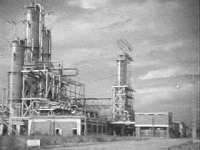 The film seqences for Quatermass 2 were shot at Shellhaven on the Thames Estuary and the story of the serial was basically about an alien monster in outer space sending bits of itself down to earth which took over the humans they entered. 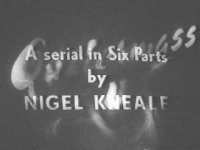 John Huntley, who was with the British Film Institute at that time had been engaged to select the incidental music for the serial, and on the day we were doing Episode 3, I saw that the music disc was about to finish too soon. So I pointed it out to John, who grabbed the first disc he could lay his hands on, gave it to me, I quickly cued it and spun it in just as the previous music disc came to an end. It might be surprising today to think back and consider that, even with the, by today's standards, primitive techniques and crooked titles (! ), those sci-fi serials of the 1950s had a great effect on the viewers. Earlier in 1999 I was told that in at least one household the whole family seemed to almost grip the armchair every time that effective opening title used to burst on the screen. 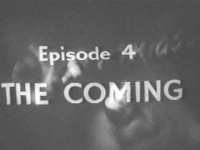 Episode Four of Quatermass II began with the warning ( a Voice Over, with the BBC Symbol) - "In our opinion it is not suitable for children or for those of you who may have a nervous disposition". 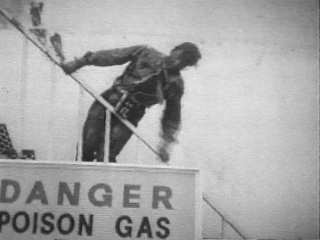 I first encountered Quatermass while I was at AP when in 1953 the first serial "The Quatermass Experiment" was transmitted live from Studio A. This was the first television science fiction serial and made quite an impact. The climax of the story is when the man who's now turned into a monster, invades Westminster Abbey. I peeped into the studio during rehearsal and saw what looked like dead branches being waved about through a window by a man standing on a ladder behind the scenery..... But because of the very limited depth of field of those Emitron cameras when exposed to only interior studio lighting, the effect on the monitors (and the viewers tv sets) was quite realistic! I was attracted to the end title music and wanted to know what it was, so while the first episode was ending I rang Studio A Gallery and asked. It was "Inhumanity " by Trevor Duncan. "What's on the other side?" I asked. The reply was - "I don't know and I can't turn it over to see 'cos I'm still playing it.....". Have you ever asked a foolish question? 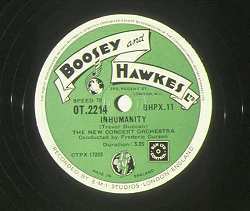 Anyway I liked the music so much I went and bought the record from Boosey & Hawkes, in London's Regent Street, shortly afterwards. After hearing that music at the end of an episode one could imagine that something quite frightening was going to happen in the next installment!